This week is a good time to spot two spaceships flying over your backyard: the International Space Station and the space shuttle Endeavour. June 11, 2002: If your neighbors hear you say this, they might laugh at you. But it's true: This is a good week to stand in your backyard and watch spaceships go by. Really. NASA's space shuttle Endeavour and the International Space Station (ISS) will make several bright appearances this week over North America. The pair should be easy to spot from most backyards in the United States. 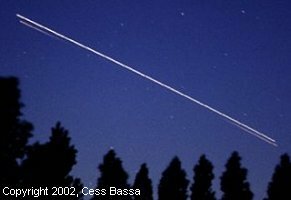 Right: On June 5th NASA's shuttle Endeavour raced over the Netherlands where Cees Bassa spotted the spacecraft and took its picture. Both the streaking shuttle (white) and its just-jettisoned external fuel tank (pale orange) are visible in his photo. Endeavour left Earth last week on a mission to deliver supplies, science experiments and a new crew to the orbiting space station. The two spacecraft are now docked together, and they'll remain so until June 15th when the shuttle is scheduled to leave. No telescope is required to see them. All you need are your eyes. A typical flyby looks like this: A dim speck of light -- the ISS -- appears near the horizon. It brightens quickly, then glides leisurely overhead, crossing the sky in 3 to 5 minutes. At its best, the station can outshine every star and planet except the Sun, the Moon and possibly Venus. More often it looks like an ordinary star, eye-catching because it moves (the ISS orbits Earth every 90 minutes at an altitude of 375 km). There are no bright lights on the outside of the station. It glows by reflecting sunlight, as much as 90% of the light that hits it. Much of the ship is covered by a light-colored insulating blanket; other surfaces are painted white or made of anodized aluminum. Even the awesome solar arrays, which must absorb sunlight to power the station, aren't completely black. Their reflectivity is near 35%. Sunset is when the ISS will be visible from North America this week. To find out exactly when, visit one of these three popular web sites: Chris Peat's Heavens Above, Science@NASA's J-Pass or NASA's SkyWatch. Each will ask for your zip code or city, and respond with a list of suggested spotting times. Predictions computed a few days ahead of time are usually accurate within a few minutes. However, they can change due to the slow decay of the space station's orbit and periodic reboosts to higher altitudes. Check again on the date of the flyby for updates. Note: these predictions could change--usually by a few minutes, but sometimes more--as the date of the flyby approaches. Check your favorite tracking website for updates before you go outside. Above: Local times when the station will appear brighter than a first-magnitude star over selected cities. In each case tabulated above, the ISS will emerge over the northwest horizon, slowly sail overhead (or nearly so), and disappear again in the southeast. Use one of these websites to find sighting times for your hometown: Heavens Above, J-Pass or SkyWatch. ISS flybys tend to come in bunches. This week and next North Americans can see the station frequently around sunset. Then there will be a lull -- a nearly two-week period when the ISS can't be seen from North America -- until July when it will re-appear in the dawn sky. The next convenient "sunset bunch" for North Americans won't come until late July and August. So step outside after dinner this week. It really is a good time for spaceship spotting. And if your neighbors laugh ... just point out that bright thing sailing overhead. It'll leave them speechless. Editor's note: The space station passes over every continent except Antarctica. 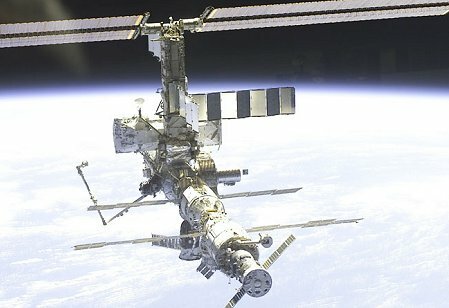 You can use the web sites mentioned in this article to discover ISS spotting times from any place in the world -- not only North America. The space station circles the earth once every 90 minutes at an altitude of about 375 km. Its orbit is tilted 52 degrees compared to our planet's equator. That's good news for sky watchers: If, say, the station's orbit were parallel to the equator, only people near the equator could see it. Instead, the station soars over places as far north as Scotland and as far south as New Zealand. Most of the world's population can spot the ISS at one time or another. A New Star in the Sky -- (Science@NASA) Something in the heavens is growing brighter and it will soon become one of the more eye-catching stars in the night sky. No, it's not a supernova. It's the International Space Station!